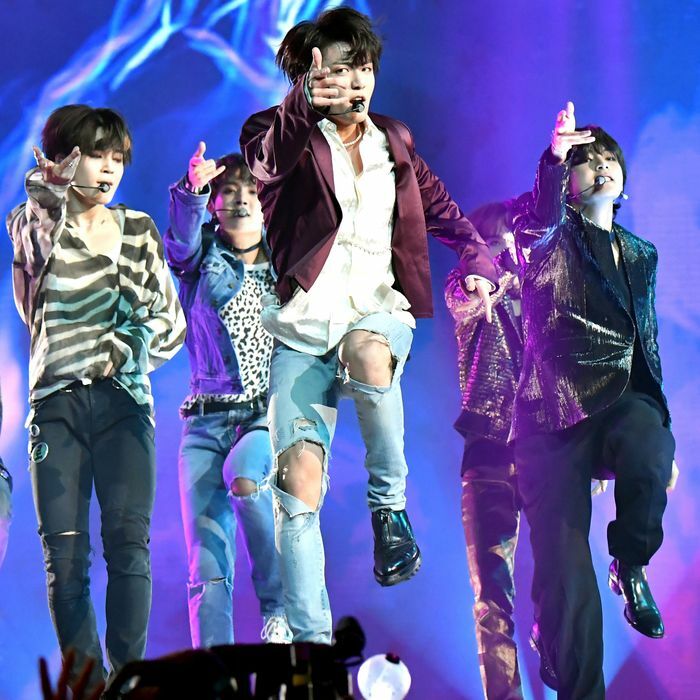 With characteristic prescience, Seo Taiji last year honored the seven-member boy band BTS as the successors to his legacy, inviting them to be the guests of honor at his 25th-anniversary concert in a symbolic baton pass before a crowd of 35,000. The living legend no doubt recognized a bit of himself in the boys’ socially conscious lyrics, their largely self-directed approach to music, and their excitable mix-and-match of rap and rock styles (with its walking bass line and a Korean press release promising a “return to the ’90s!,” one might even hear in BTS’s debut single “No More Dream” a nod to his early hit “Come Back Home,” which BTS later covered for a tribute album). And he perhaps found some vindication in their ongoing global ascent, which by that point had already claimed several all-time highs for K-pop in Europe and the United States. Now, BTS has taken Korean-language music to the summit of album chart Everest: their latest, Love Yourself: Tear, debuted at No. 1 on the Billboard 200 last month, knocking Post Malone from his perch. Throughout the group’s journey, American media has fixated more and more on their Stateside growth, with a brace of explainers and thinkpieces to accompany their every milestone. In doing so, journalists have grappled with vague notions of a “K-pop formula,” or blamed geopolitical tensions in East Asia for their westward pivot (BTS’s focus on America — and the true beginnings of their success there — predates the THAAD crisis by at least a year). Estimations of the seven young men’s “androgynous” appeal typically reveal more about the narrowness of America’s male beauty standards than it does anything about BTS or K-pop. The group’s oft-cited support for social causes may well play a part in their fans’ adulation, but progressive leanings have been a feature of K-pop for decades. And frequent attempts to assign credit to (and curry retweets from) ARMY, the most quantifiably active fandom in history, offer as much insight as does the observation that someone is rich because they have a lot of money. Plaudits for BTS’s American fan base — which has evolved to assume a conglomerate anatomy, with fully flexed PR and philanthropic arms — seldom involve a guess as to why BTS is the one K-pop act to have inspired such a following, out of the hundreds of groups to debut this decade. Granted, the non-specialists typically tasked with figuring out the BTS phenomenon on tight deadline can scarcely be blamed — even Korean media has admitted to struggle with cracking the group’s unique code. BTS took some time to figure it out, too. Many of the traits that have been pegged as reasons for their eventual triumph were present since their debut in 2013, and in fact were nothing unique for a K-pop group at the time. Members like RM (then “the Rap Monster”), Suga, and J-Hope collaborated with their label’s in-house producers on lyrics and music, as was then the industry trend. Featuring teenage recruits from Korea’s rap underground and introduced in their inaugural press release as a “hip-hop idol” hybrid act, they dabbled in the golden era sounds of G-funk, boom-bap, and turntablism, alongside the residual nu-metal and overloaded trap bangers then commonplace among Korean boy bands. Few made it out of those years without a dubstep breakdown, and BTS was no exception; the word swag appeared frequently on lyric sheets. The majority of their early music videos were handled by Zanybros, a Seoul production house known for turning out upwards of 100 fill-in-the-blank videos a year, with a credit list that read like K-pop roll call. And on camera, BTS wore the genuine articles of streetwear brands already prevalent as bootlegs on the sidewalks of Seoul. In short, their sound, image, creative involvement, and Korean sales were all roughly comparable to those of other rap-based idol groups of the time, like Block B and BAP. At this point, these peers had even made more meaningful inroads into America than had BTS, selling thousands of tickets on tours that ran from New York to far-flung territories like Miami Beach and Grand Prairie, Texas. Meanwhile the elder statesmen of self-made, rap-centric K-pop, Big Bang, were in another stratosphere altogether, playing to over 10,000 fans a night in America and Britain, and winning considerable Western media clout. When BTS announced a free surprise 2014 gig at a tiny club in Los Angeles — traditionally the strongest Stateside beachhead for K-pop — barely 400 fans showed up to vie for a spot. The performance was part of a curious TV series called American Hustle Life, which followed BTS as they received the wisdom of Californian oldheads Coolio and Warren G. Fans now look back fondly on the show as a relic of a simpler time (and an endless meme supply), but the group’s awkward interactions with the living ghosts of hip-hop’s past did them few favors in 2014. A common bit of gossip in the K-pop industry at the time was that BTS’s management were at a loss as to why the group’s paid affiliation with a couple of mid-’90s West Coast greats had done little to raise their profile in America. In the long history of Asian pop’s attempts in the American market, this is where the story usually ends: After middling momentum and a couple big cultural gaffes, the artist’s agency decides to shift focus to more familiar markets back East. The difference, in this case, was Bang Si-hyuk. Also known as “Hitman” Bang, the Big Hit founder had studied aesthetics at Korea’s top Seoul National University, made a name as a pop songwriter in the ’90s, and had been running his company just well enough to keep the lights on for about a decade. Following the Coolio fiasco, an early slot at Los Angeles’s KCON festival, and an unremarkable Western response to BTS’s new Dark & Wild album, the boys would dedicate the end of 2014 and early 2015 to the lucrative Japanese market — but Bang spent much of that time continuing to ponder America. Of all the things he was about to get right, his single most important stroke of genius may well have been recognizing, before anyone else in the Korean music industry, that America’s diehard K-pop fan base had become a big enough demographic to prioritize when creating and marketing content. What weren’t these fans getting from other K-pop groups at the time? What else, beyond K-pop, did they like? Even a couple years and millions of CD sales later, Bang humbly told Billboard that he would continue to “think harder [about] what makes fans enthusiastic and passionate about BTS’ music and the band.” But suffice to say, by early 2015 he’d had a major breakthrough. Just as crucial were the updates to the band’s visual aesthetic. For lead single “I Need U,” BTS reunited with Lumpens, a video production team that had pinch-hit for Zanybros on a couple of the group’s previous videos, faithfully repeating the same formula of pop flash and readymade simplicity. This time, however, Lumpens reinterpreted the boys’ dynamic with a gritty desperation that was in no small part authentic: a favorite bit of fan trivia is the fact that Big Hit ran out of budget during filming. The album’s promotion shots likewise saw BTS shrugging off their old K-pop uniforms — streetwear, school clothes, Photoshop — for a more personal, direct-flash appearance, coming off equally candid in a hotel room or beneath a giant cherry blossom tree. Whether by design or happy accident, nearly everything about The Most Beautiful Moment, musically and visually, felt right in line with the tastes of Tumblr circa 2015, then the biggest gathering spot for Western K-pop fans — even the lovely album covers of Parts 1 and 2 could just as well be vaporwave. What’s more, all these keen changes to BTS’ sound and image cast new light on the things about them that stayed the same. With this more honest, confessional new material, the group’s creative involvement in their own music no longer came across as a simple flex, but rather another proof of BTS’s rare authenticity. As was the case with their commitment to continuity: few cared much about the connections between the albums in BTS’s debut “school trilogy” at the time, but that approach was now paying dividends with the Most Beautiful Life series, especially as the lore of its lyrics and music videos referred back to the group’s lesser-known prior releases, while setting up and stoking anticipation for the story lines of their future ones. K-pop groups had previously been known for cycling through artistic “concepts” at a breakneck pace, changing sound and image at a rate that often confused or disappointed Western fans. BTS, on the other hand, stayed consistent and evolved gradually, reinforcing the notion that who you saw on camera was who these people really were. The single most important holdover from their early days was the group members’ SNS presence. While K-pop groups typically go years without any personal social media activity — most agencies consider it a liability, as they might say something controversial — BTS had been regularly sharing personal vlogs to their BANGTANTV YouTube channel since their days as trainees. Alongside brief experiments with Vine and Musical.ly, later dominance of Korea’s global V Live video platform, and the behind-the-scenes “Bangtan Bomb” clips they continue to share to this day, BTS has always maintained a direct and unscripted line to their fans. Beginning with The Most Beautiful Moment, these off-the-cuff snapshots twinned with the more considered statements of their music videos (and later, short films) created a content stream so rapid and total that BTS fans simply didn’t have the time or desire to follow any other groups. Released in April 2015, The Most Beautiful Moment’s impact was immediate: BTS played four cities in America that summer, averaging over 4,000 attendees per night, and the record’s part-two follow-up that fall was their first to break the Billboard 200 albums chart. Since then, each of their major releases has leapfrogged the last on the American charts, culminating thus far with the jump from last September’s Love Yourself: Her mini-album (No. 7 on the Billboard 200, with the “Mic Drop” remix reaching No. 28 on the Hot 100 singles chart) and last month’s Love Yourself: Tear (No. 1, with lead single “Fake Love” debuting at No. 10). As with their concert growth: BTS has succeeded in America in part by making sure their fans have had a major opportunity to see them every year, and at this point they’ve already sold out a 14-date run through North American arenas this fall (including a four-night residency at Los Angeles’s 19,000-capacity Staples Center). During the past three years they’ve gradually expanded their palette of production techniques, genre influences, and visual aesthetics — but everything has been a clear iteration upon and refinement of the perfect, commercially potent balance the group and Big Hit discovered in The Most Beautiful Moment. In that, they are not alone. The group’s been iterating on the series’ core principles, and commercial success, ever since. After 2015, it seems like almost every K-pop boy band has spent time considering BTS’s example. Acts like GOT7 and Monsta X have released conceptual trilogies of their own; girl group LOOΠΔ’s obsessive world-building seems to have learned a thing or two from the total immersion BTS has achieved with their fans; and pretty much every group seems a great deal more prone to dark themes, minor keys, and hard-hitting choreography. If, to the uninitiated, BTS’s act seems like just one example of the K-pop formula, that’s because they and Bang redefined it. The perfect confluence of factors that helped BTS take America was no accident, but an inspired synthesis of aesthetic and rhetorical decisions based in part on a savant’s observation of Western K-pop fans and what makes them tick (and, crucially, a clear understanding of who BTS were as people and musicians, and in what ways they could fulfill those desires while remaining true to themselves). Along the way, Bang and the boys have driven considerable growth in that demographic: While many of their more recent fans consider themselves separate from the typical K-pop crowd (ironically, typical of K-pop fan behavior: true-blue fandom members devote all their attention and money to just one group), Big Hit and BTS have succeeded mainly in reaching Westerners who are receptive to the rites and rituals of K-pop boy band fandom. That includes, say, the purchase of a branded lightstick to wave at concerts, as well as doing whatever possible to contribute to their success — including streaming and purchasing the same content as much as one’s budget permits. In this sense, it’s worth noting that while BTS’s American success is without Asian pop precedent, the 100,000 physical units BTS sold in America in their new album’s release week do not represent 100,000 individual fans, and ditto the 180,000 tickets they’ve sold for their upcoming continental tour. To wit, YouTube shaved 6 million obviously bogus views off of the 24-hour tally for “Fake Love,” bringing it down to a (nevertheless astounding) 35-million total. This is the story, then, of how seven young men managed to reach No. 1 on Billboard on the strength of what is essentially the largest, most enthusiastic niche audience in the country. The American mainstream’s timidity up to this point has become irrelevant: In pop culture today, few things speaks louder than numbers, and a top-selling album in the world’s largest music market means everybody’s watching now. Whether BTS doubles down on their day ones — they’ve said they have little interest in singing in languages beyond K-pop’s lexicon: Korean, Japanese, and just a dash of English for color — or try to adjust their posture for a wider swing will be one of the more interesting details to track moving forward. In any event, the world has changed: For the first time, an Asian act is leading the conversation.